Alice was beginning to get very tired of sitting by her sister on the bank, and of having nothing to do: once or twice she had peeped into the book her sister was reading, but it had no pictures or conversations in it, "and what is the use of a book," thought Alice, "without pictures or conversation?" There was nothing so very remarkable in that; nor did Alice think it so very much out of the way to hear the Rabbit say to itself "Oh dear! Oh dear! I shall be too late!" 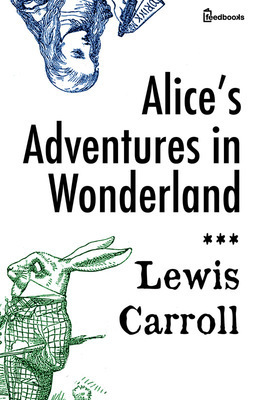 (when she thought it over afterwards, it occurred to her that she ought to have wondered at this, but at the time it all seemed quite natural); but when the Rabbit actually took a watch out of its waistcoat-pocket, and looked at it, and then hurried on, Alice started to her feet, for it flashed across her mind that she had never before seen a rabbit with either a waistcoat-pocket, or a watch to take out of it, and, burning with curiosity, she ran across the field after it, and was just in time to see it pop down a large rabbit-hole under the hedge. Either the well was very deep, or she fell very slowly, for she had plenty of time as she went down to look about her, and to wonder what was going to happen next. First, she tried to look down and make out what she was coming to, but it was too dark to see anything: then she looked at the sides of the well, and noticed that they were filled with cupboards and book-shelves: here and there she saw maps and pictures hung upon pegs. She took down a jar from one of the shelves as she passed: it was labelled "ORANGE MARMALADE," but to her great disappointment it was empty: she did not like to drop the jar, for fear of killing somebody underneath, so managed to put it into one of the cupboards as she fell past it. Presently she began again. "I wonder if I shall fall right through the earth! How funny it'll seem to come out among the people that walk with their heads downwards! The antipathies, I think - " (she was rather glad there was no one listening, this time, as it didn't sound at all the right word) " - but I shall have to ask them what the name of the country is, you know. Please, Ma'am, is this New Zealand? Or Australia?" (and she tried to curtsey as she spoke - fancy, curtseying as you're falling through the air! Do you think you could manage it?) "And what an ignorant little girl she'll think me for asking! No, it'll never do to ask: perhaps I shall see it written up somewhere." Down, down, down. There was nothing else to do, so Alice soon began talking again. "Dinah'll miss me very much to-night, I should think!" (Dinah was the cat.) "I hope they'll remember her saucer of milk at tea-time. Dinah, my dear! I wish you were down here with me! There are no mice in the air, I'm afraid, but you might catch a bat, and that's very like a mouse, you know. But do cats eat bats, I wonder?" And here Alice began to get rather sleepy, and went on saying to herself, in a dreamy sort of way, "Do cats eat bats? Do cats eat bats?" and sometimes "Do bats eat cats? ", for, you see, as she couldn't answer either question, it didn't much matter which way she put it. She felt that she was dozing off, and had just begun to dream that she was walking hand in hand with Dinah, and was saying to her, very earnestly, "Now, Dinah, tell me the truth: did you ever eat a bat?" when suddenly, thump! thump! down she came upon a heap of sticks and dry leaves, and the fall was over.